People, it's finally here...Halloween season! My definition of a Halloween themed dessert is quite simple–Take an otherwise delicious treat and make it spooky in some way. Because, after all, Halloween desserts can be creepy as all hell, but they should still taste good! 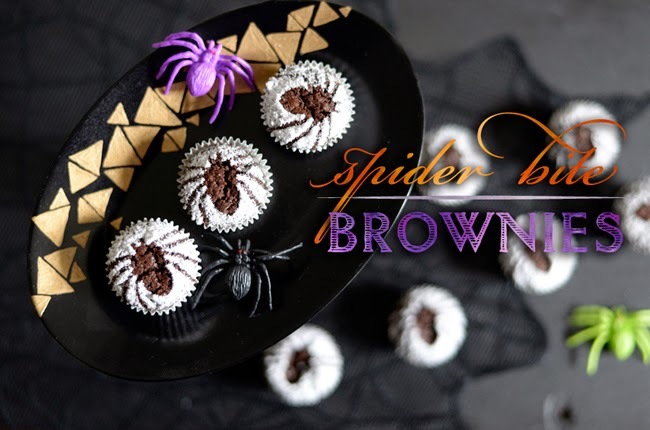 Enter the brownie spider bite...my solution to the Halloween themed dessert. I find it hard to believe that this blog is without a post that showcases the brownie. 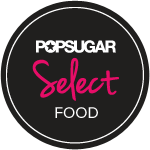 It truly is the best dessert food out there. Show me someone who doesn't like brownies and...well, actually don't show me because I don't want to be acquaintances with anyone who doesn't appreciate a brownie as one of the great things in life. I've actually been working out my brownie recipe for some time now, which may seem silly seeing that a brownie is not a complex dessert. Yes, the ingredients and steps are minimal, but that just means they should be done right. There are a few elements to a brownie that are up for debate, but in the end it boils down to a matter of preference. 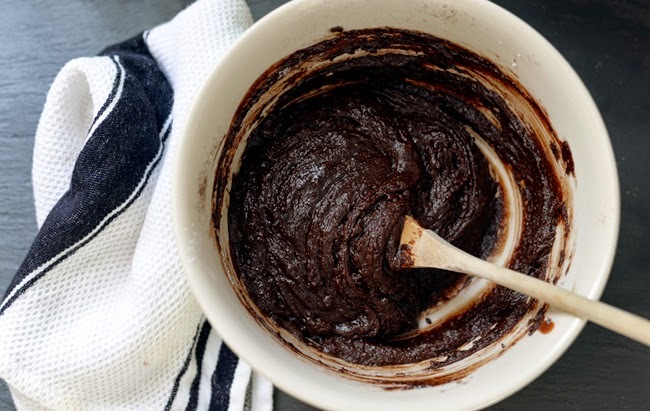 Do you use cocoa powder or unsweetened chocolate? I prefer both! One thing's for sure, the chocolate needs to be high-quality, dark and delicious. Do you like a cake-like or fudge-like texture? I err on the side of fudgy, and for that reason, I give you a recipe with less flour and more butter. I also contemplated adding in candy to keep things Halloween festive, but in the end I kept the brownies pure and simple. A hint of espresso lets the chocolate shine and I now intend on making these for every holiday. Flag day brownie bites, anyone? So, how do we make these brownies spooky. While perusing the aisles at my grocery store, I happened upon a $2 bag of plastic spiders. Jackpot. 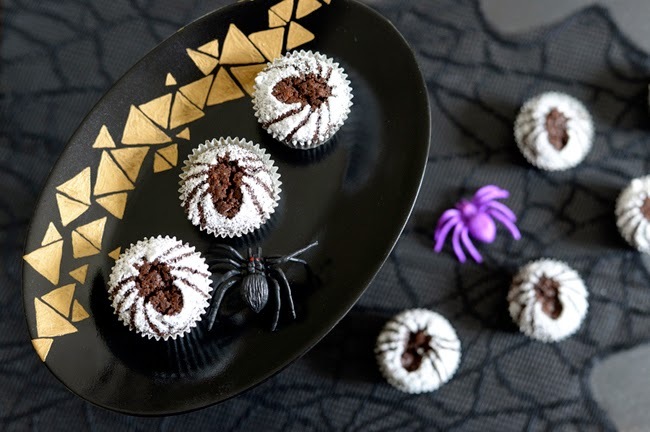 I never intended on actually serving something plastic on my brownie bite, I simply used the spider and a dusting of powdered sugar to create a spider silhouette. Any plastic spider will work, as long as its no bigger than the size of the brownie bite. In the end I think these look slightly more like beetles than spiders. But hey, a bug's-a-bug, right? 1. 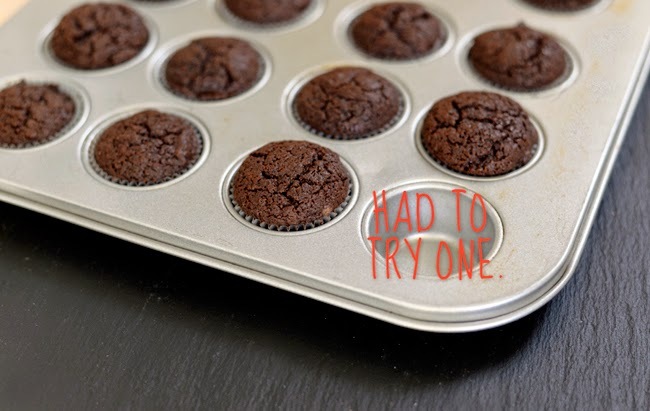 Preheat the oven to 350 degrees and line a 24-cup mini muffin tin with liners. 2. Melt the butter in the microwave or on a stove top. 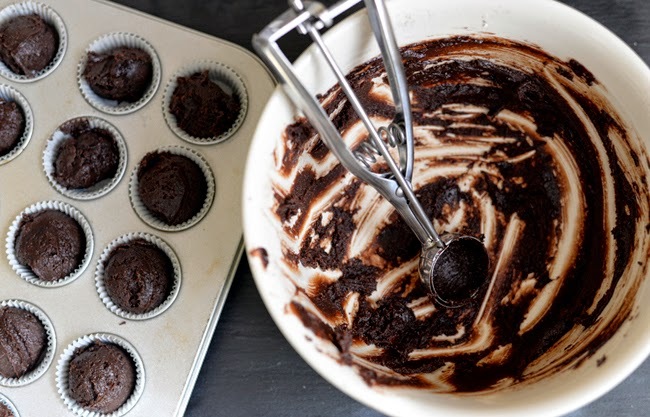 While it's hot, pour into a mixing bowl filled with the chopped unsweetened chocolate. 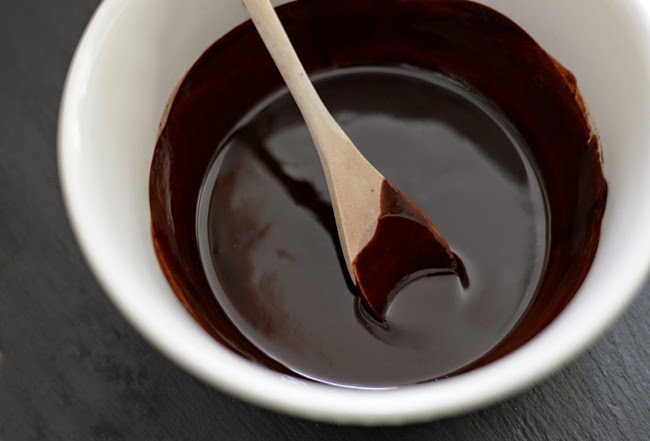 Stir until the chocolate is melted and let cool to room temperature. 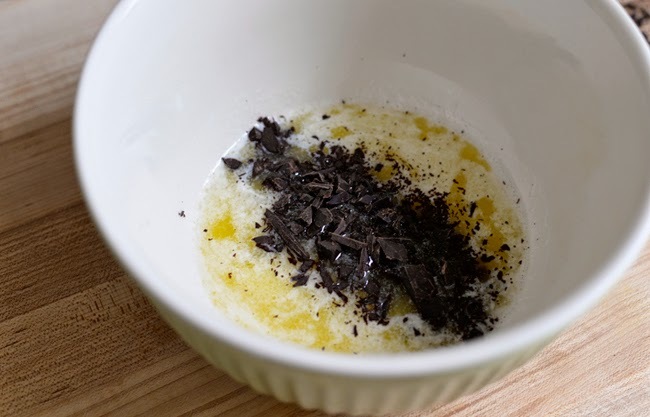 Mix in the sugar and eggs, one egg at a time, until fully incorporated. Stir in the instant espresso and vanilla. 3. 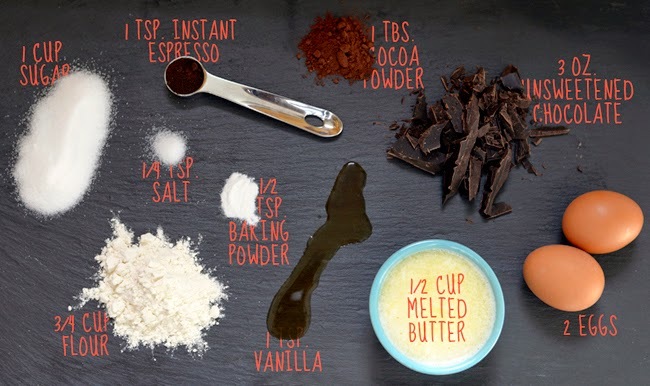 Fold in the flour, baking powder, cocoa powder and salt until just combined. Fill the muffin cups three-quarters full and bake for 15-20 minutes. Set aside to cool. 4. 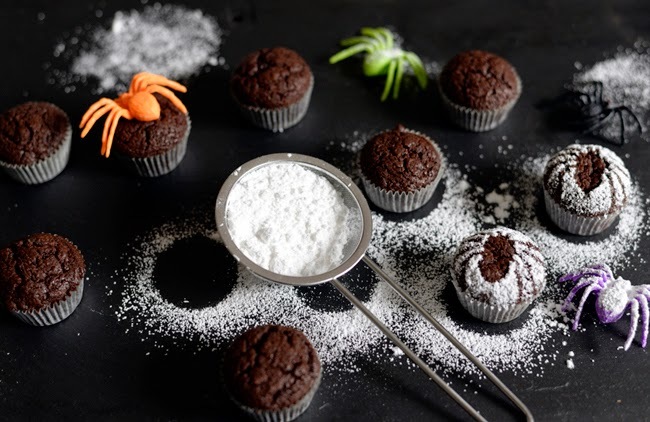 To make the spider silhouette, place a plastic spider on top of the brownie, then gently tap a fine strainer filled with powdered sugar until the brownie is covered. Remove the spider and the silhouette with remain. It's magic, people.